Concrete Phenomenon: In the Animal Planet original documentary nature series, Meerkat Manor, the viewer is presented with a reality different from other nature programs, and therefore, a different kind of response to that reality is generated by the viewer. In Meerkat Manor, the meerkats (the main characters) are given names, roles, personalities, and many other traits that make them appear more human-like (anthropomorphism). Narration provides a dramatic story-telling of their daily lives as they unfold on the African plain. A few weeks ago, when one of the main characters (Flower) died, viewers responded in such a way that went beyond a reaction to the acceptable drama of the natural world; newspaper articles, online chats, and memorial YouTube videos sprang up overnight about the tragic event. 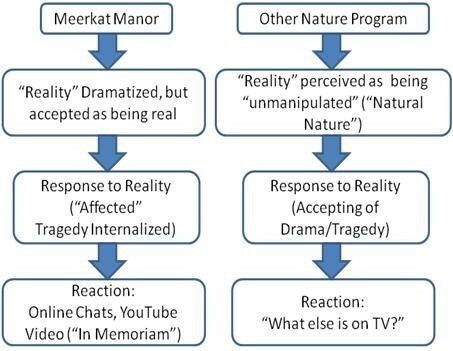 In short: A meerkat died in an African desert and America is in mourning; not because it was a dramatic natural event, but because of how reality was presented to the viewer, how viewers reacted to that reality, and what viewers did with that reaction or what that reaction produced (YouTube videos, online chats, etc.). What was interesting about this topic for me was the journey that the phenomenon took across different mediums; starting in television, ending with the internet, and venturing through the viewer’s “impression of reality” in between. I also enjoyed the opportunity to address a phenomenon using a parallel, but opposing example. I followed the same format that I used in the last pre-writing exercise and, once again, found the “idea list” or “mind puke” (as Marty says) to be the most beneficial and the most uninhibited. From those ideas, the flow chart helped me to visualize my argument and made an outline very easy to produce.